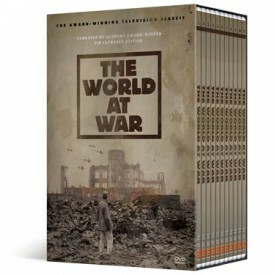 A great option for learning about World War II is the epic DVD narrated by Laurence Olivier. It has 26 hours "of newsreel, propaganda, and home-movie footage drawn from the archives of 18 nations, including color close-ups of Adolf Hitler taken by his mistress, that present an unvarnished perspective of the war's pivotal events." THE WORLD AT WAR is the recipient of numerous accolades, including an International Emmy Award®, The National Television Critic's Award® for Best Documentary, and knighthood for its creator, Sir Jeremy Isaacs. It is one of our family favorites and we continue to keep it at hand. Geared for the high school student in your home. We have purchased a number of these for gifts. I have found them at Costco and The History Channel store, as well as Amazon.